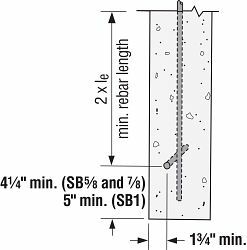 The SB anchor bolt offers an anchorage solution for our holdowns that call for a 5/8"-diameter, a 7/8"-diameter and a 1"-diameter anchor. 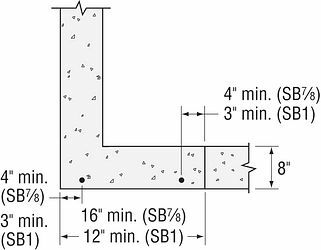 SB anchor bolts are code listed by ICC-ES under the 2012/2015/2018 IBC and IRC. None. 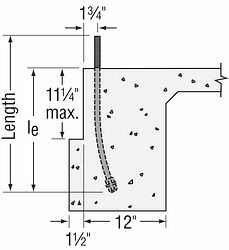 May be ordered HDG; contact Simpson Strong-Tie. 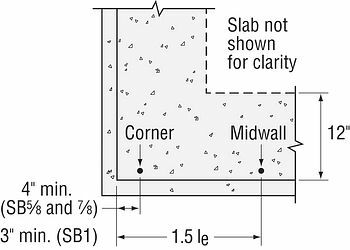 SB is only for concrete applications poured monolithically except where noted. Top nuts and washers for holdown attachment are not supplied with the SB; install standard nuts, couplers and/or washers as required. 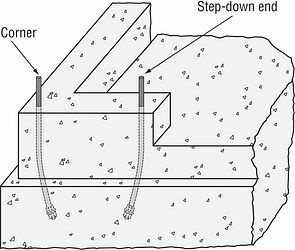 On HDG SB anchors, chase the threads to use standard nuts or couplers or use overtapped products in accordance with ASTM A563, for example Simpson Strong-Tie NUT5/8-OST, NUT7/8-OST and NUT1-OST, CNW5/8-OST, CNW7/8-OST and CNW1-OST. 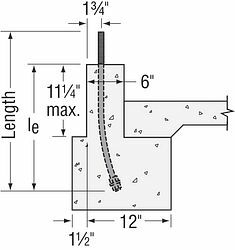 Install SB before the concrete pour using AnchorMate® anchor bolt holders. Install the SB per the plan view detail. 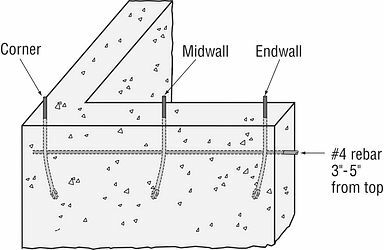 Minimum concrete compressive strength is 2,500 psi. 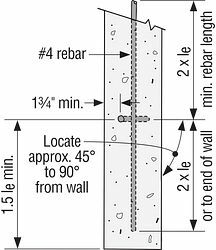 When rebar is required it does not need to be tied to the SB. 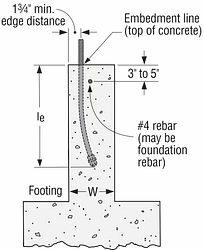 Rebar is required at the top of stem wall foundations, but is not required for slab-on-grade edge and garage curb, or stem wall garage front installations. 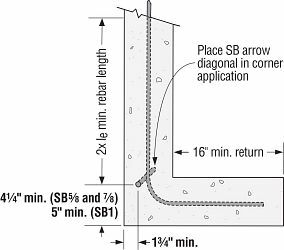 Minimum end distances for SB bolts are as shown in graphics. To obtain LRFD values, multiply ASD seismic load values by 1.4 and wind load values by 1.67 (1.6 for 2012 IBC). 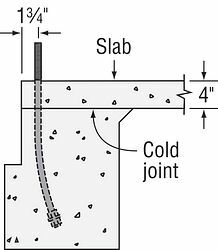 Per Section 1613 of the IBC, detached one- and two-story dwellings in SDC C may use "Wind and SDC A&B" allowable loads. 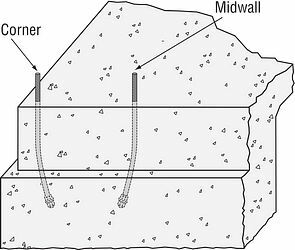 Midwall loads apply when anchor is 1.5 le or greater from the end. 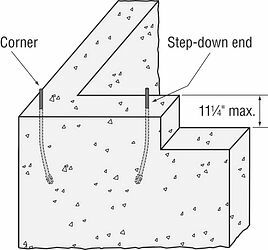 For bolts acting in tension simultaneously, the minimum bolt center-to-center spacing is 3 le. 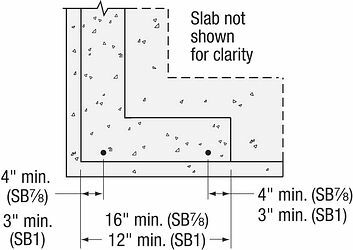 Full catalog loads apply for two-pour installation for slab-on-grade: edge. SB See specific model numbers for code listings.